Buy Almighty Foods Cashew Caramello Gourmet Nut Butter in the UK from our online shop or directly from our independent Scottish store. This tasty organic nut butter is made from stone ground cashews and is gluten free, vegan and raw! Almighty Cashew Caramello is a caramel like spread made from raw cashews, dried coconut, tigernuts and coconut sugar. Almighty Cashew Caramello is a caramel like spread made from raw cashews, dried coconut, tigernuts and coconut sugar. It's stoneground to a silky smooth, velvety texture and is perfect for spreading, dipping, drizzling, blending, sharing or just as a general tool in your arsenal of feel good culinary magic. Cashew nut*, dried coconut flesh*, evaporated coconut nectar*, tigernut*, vanilla pod*, Hebridean sea salt, lemon essential oil*. We sell real Almighty Foods and other Honeys, Jams & Spreads directly from our shop in Scotland and online throughout the UK. View more products from Almighty Foods. Where can you buy real Almighty Cashew Caramello safely online? If you are wondering where you can buy Almighty Foods Cashew Caramello Gourmet Nut Butter safely online in the UK, then shop with us. We are an actual health foods shop; with real people selling real foods and products. Our award-winning independent shop is located in Stirling, Scotland since 1976. You can buy our Honeys, Jams & Spreads in store or safely place an order with us online or over the phone. 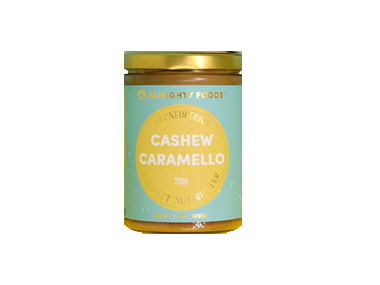 Almighty Cashew Caramello - Almighty Foods Cashew Caramello Gourmet Nut Butter in Honeys, Jams & Spreads and Foods.